Marc talks about what happened on this day in history, including the day playwright and activist Lorraine Hansberry died, the day the 2010 earthquake in Haiti killed 316,000 Haitians, and the day the Supreme Court made it illegal for states to discriminate against law-school applicants because of race. This is Marc Steiner, and today is January the 12th. 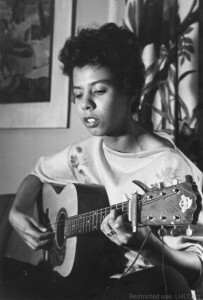 That was the voice of the great playwright Lorraine Hansberry, who we lost in 1965. Born in Chicago, Hansberry wrote ‘A Raisin in the Sun’ and was the first black playwright and the youngest American to win a New York Critics’ Circle award. She was the granddaughter of a freed slave and an activist, deeply committed to Black equality and human rights. ‘A Raisin in the Sun’ was autobiographical: her own family had moved to a white neighborhood in the late 1930s and was violently attacked by neighbors. Still, they refused to move. Eventually, a court ordered that they must move, but the case made it to the Supreme Court where restrictive covenants were made illegal. In 1915, the House of Representatives rejected the Women’s Suffrage Bill that would have granted women the right to vote by a wide margin. 57 members of the House abstained from voting. President Woodrow Wilson would publicly declare his support for the bill two years later when the Democratic Party and general public seemed more friendly to the idea, but that attempt at a constitutional referendum also failed. In 1920, women’s suffrage would be established nationwide. We celebrate the birthdays of three important people on this day. First, Mordecai Wyatt Johnson, born in 1890 in Paris, Tennessee. He was an educator and the first Black president of Howard University. Johnson served as pastor of the First Baptist Church in West Virginia from 1917-1926. He was unanimously elected president of Howard University, a position he held until he retired. His legacy at Howard includes a greatly expanded campus, a new library and new structures for schools within the university. Under his tenure, enrollment at Howard went from 2,000 students to 10,000 students. It is also the birthday of heavyweight boxing champion Joe Frazier, born in 1944 in Beaufort, South Carolina. Smokin’ Joe was an Olympic gold medalist and an Undisputed World Heavyweight Champion. Of course famously lost that titel by Muhammed Ali. He had heart, forced to flee South Carolina when he was 14 for beating the overseer of the cotten fields who whipping his father He now sits in International Boxing Hall of Fame. And its the birthday of novelist Walter Ellis Mosley, born in Los Angeles, California in 1952. Known for his Easy Rawlins series about a black private investigator, he is a prolific writer who has penned more than 40 books. His mother was Jewish and his father was African American, and his can traverse culture as few others. And in 1967, Reverend Philip Berrigan and 5 others alleged plotting to kidnap Henry Kissinger and blow up the tunnels of federal buildings in Washington, DC. Two important Supreme Court cases were ruled in this day, one opening a door the other closing a door.. In 1948, the decision in Spiel v. University of Oklahoma made it illegal for states to discriminate against law-school applicants because of race. And in 2000, the decision in Illinois v. Wardlow gave police broad authority to stop and question people who run at the sight of an officer. And today we remember the 316,000 Haitians who were tragically killed in the 2010 earthquake that hit Haiti and destroyed the city of Port-au-Prince. Here’s a song and for us to think about as we go about our days on this January the 12th. It’s by a musician born today in Rossville, Tennessee in 1904. They began playing guitar at the age of 14 and were known for playing guitar with a slide on their ring finger. Do you know what hill country and blues artist I’m talking about? Mississippi Fred McDowell. And here’s his performance of “Shake Em On Down”.